"Founders of the Tractor Industry"
collector, restorer, and people interested in the Hart-Parr, Oliver Hart-Parr tractors. We will concentrate on the lightweight Hart-Parr models built from 1918 to 1930 and the Oliver Hart-Parr models built from 1930 to 1937. Charles W. Hart and Charles H. Parr founded the Hart-Parr Company. First located in Madison, Wisconsin, in 1901 it was relocated to Charles City, Iowa, the hometown of Hart. 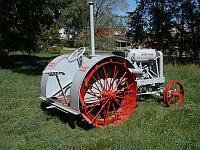 Production started on tractor manufacturing in 1901 with the first tractor being sold in 1902. From 1902 to 1919 Hart-Parr built large, oil cooled tractors. These tractors were used to plow the virgin prairies of North America and to power various machines to help bring in the bounteous harvest of grain to feed the growing population of the the United States. In 1918 a new water cooled and smaller tractor was put into production, leaving behind the old concept that in order to have horsepower you must have a large and often times clumsy machine. 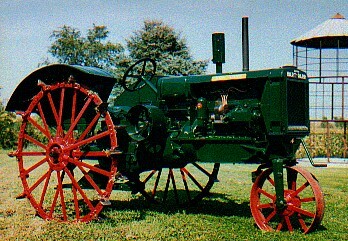 Hart-Parr is credited for coining the word TRACTOR. These two men are known for being the Founders of the tractor Industry. In 1929 four companies merged to form the new Oliver Farm Equipment Company, putting an end to the old Hart-Parr name. Hope you enjoy looking and learning about these tractors. Dave Preuhs, Le Center, Minnesota.